This "vignette" by John Cook Kitchens is one of two kitchens that can be used for cooking demonstrations. For all who have traipsed from open house to open house in search of kitchen and bath inspiration, there's no need to wait for Sundays anymore. Servco Home and Appliance Showroom, which will unveil its fully renovated space tomorrow, now features 22 kitchen "vignettes" created by 13 Hawaii designers. There are enough ideas for homeowners and industry professionals packed into the 7,000-square-foot space to launch a thousand renovations. A public celebration will take place from 10 a.m. to 4 p.m., with TV chef Martin Yan of "Yan Can Cook" conducting demonstrations throughout the day on GE Monogram appliance kitchens created by Studio Becker and John Cook Kitchens. The show kitchens will provide a venue for classes and demonstrations beginning next month. The renovation brings the showroom into the 21st century, where the old-fashioned notion of simply showing rows and rows of ovens and sinks just isn't enough for consumers long spoiled by home-renovation TV programs and architectural photographs in home and interior-design magazines. "Before, we had no cabinetry," Servco group Vice President Craig Washofsky said. "We never displayed hoods. People had to choose out of catalogs. One of the challenges is that when people come in looking for finer appliances, to ask them to pick something out of a catalog is not satisfying. "We started talking about improving our displays, and by inviting the top local designers to create these vignettes, we can better represent the lines." 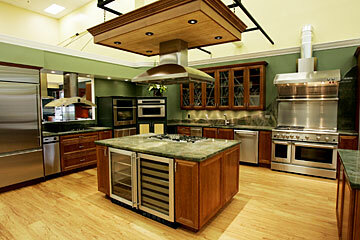 The kitchen designs embrace a range of styles from Euro chic to modern to Hawaiian contemporary. "The amazing thing is no two kitchens look alike, and we never told anyone what to do," Washofsky said. "We just gave them the space, and they came up with different designs." 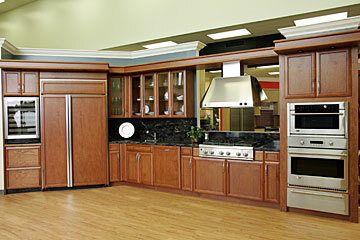 The Hawaii Woodcrafts kitchen display above features granite counters, GE Monogram appliances and cherry wood. Clients entering through the parking lot entrance will be greeted by a kitchen created by Hawaii Woodcrafts, using GE Monogram appliances, granite and cherry wood. A conference center was created to provide a space for designers to meet with clients to talk about renovation plans after viewing the many kitchen, bath and shower possibilities. Hawaii Woodcrafts President Greg Molica has his own Koapaka Street showroom featuring seven of his own kitchen vignettes for residential and commercial clientele, but he said, "There's never enough space to show appliances, and (the Servco showroom) is definitely a nice place for people to browse. I think I'm going to be using it a lot." Molica's wife, Renee, said, "This will help people like me, who would look at a wall of ovens and not be able to visualize what it would look like in an actual kitchen. It puts it in context."